The Downton Abbey series 6 Blu Ray shows us both upstairs and downstairs of the Granthams of Downton Abbey. It stars Hugh Bonneville and 'Whats A Weekend?' Maggie Smith. The Downton Abbey season 6 Blu Ray includes all the episodes of series 6 and many bonus features including the finale. We return to the sumptuous setting of Downton Abbey for the sixth and final season of this internationally acclaimed hit drama series. As our time with the Crawleys begins to draw to a close and we see what will finally become of them all, the family and the servants who work for them, remain inseparably interlinked as they face new challenges and begin forging different paths in a rapidly changing world. Secrets and rifts threaten the unity of the family, while those below stairs continue to navigate social changes which put their futures in jeopardy. The final season of the multi-award winning series offers all the highs and lows, joy and sorrow, that viewers across the globe have grown to love and follows all our favourite characters as they strive to find happiness once and for all. Includes all 9 episodes from Season 6, including The Finale. 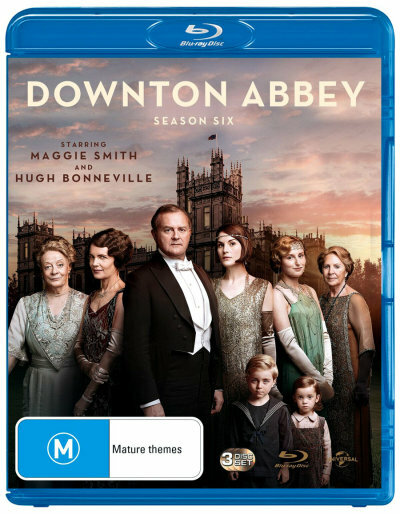 Click the button below to add the DOWNTON ABBEY - COMPLETE SERIES 6 (BLU RAY) to your wish list.